Fell's Run is a small town in eastern Rivenspire, south of Northpoint. Fell's Run Objective: Help restore peace to the town of Fell's Run. 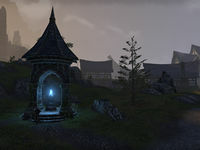 Fell's Run Wayshrine is located southwest of the town, near the Edrald Estate.